SAGE was initiated by National Grid but was then adopted by the Department of Health in order to provide advice to Government on how to respond to the NRPB's 2004 recommendation to consider possible precautionary measures. It was funded equally by the electricity industry, Government, and the charity Children with Leukaemia (now Children with Cancer). It was run on inclusive lines, with an emphasis on including all viewpoints, and a facilitator rather than a traditional Chairman. Its work finished in 2011. We give an overview of SAGE's work on this page with links to more detail on separate pages. On house wiring, it made a number of recommendations to remove features that sometimes produce high fields. On appliances, it recommended that manufacturers consider marketing low-field appliances. On power lines, it recommended more information for the public, and a technical measure called "optimal phasing". It presented as an option for consideration, but did not recommend, "corridors" where housing development would not be permitted close to power lines. It used a cost-benefit analysis to decide what should be recommended. More details on all of these. When Government received the SAGE First Interim Assessment, they asked the HPA for a response to it. The HPA's response is available here and the Minister's reply is here [link temporarily unavailable]. The formal Government response to SAGE's First Interim Assessment was published in October 2009 as a Written Ministerial Statement. It adopted most of the recommendations on house wiring and on optimal phasing, but did not adopt the option for corridors, which was judged disproportionate. More details on the Government response. After 2007 there was a lull in SAGE activity but it then restarted, looking principally at precautionary measures for EMFs from distribution systems. 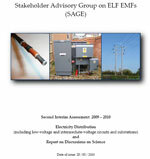 The Second Interim Assessment was published in June 2010. It makes many recommendations relating to distribution networks, many endorsing existing best practice. It also reports a Science Forum within SAGE. Full details here. When Government received the SAGE Second Interim Assessment, they asked the HPA for a response to it. The HPA's response is available here. SAGE covers only power-frequency EMFs (which it describes using the alternative definition "extremely low frequency" or ELF).